A surprise earnings beat from Noble has several offshore drilling stocks jumping higher. Before you jump in, make sure you understand the risks as well as the potential. NE Price data by YCharts. Today's jump for these stocks is largely tied to Noble's earnings release. The company reported an adjusted loss of $0.15 per share. And while a loss isn't exactly great, Wall Street analysts were expecting a much bigger $0.22-per-share loss from the company this quarter. On a GAAP basis, Noble's loss was much bigger, as the company took a $1.3 billion impairment against five of its drilling rigs. From an operations perspective, Noble has made a lot of progress. The company generated positive operating cash flows in 2016, and the impairments above are a reminder that the global drilling vessel fleet still has a lot of rationalization to go through before reaching parity with existing demand for work. There's still less offshore activity, and that's not changing overnight. Image source: Getty Images. From a capital perspective, Noble remains on sound footing. The company issued $1 billion in new debt in the fourth quarter, due in 2024, and used $762 million of the proceeds to pay off debt due in 2020, 2021, and 2022. At the quarter's end, Noble reported a cash balance of $726 million, $2.45 billion in undrawn credit capacity, and no major debt maturities within the next couple of years. Noble's report comes on the back of a surprisingly good report from Diamond Offshore on Feb. 6. The company delivered a strong $0.53-per-share earnings profit. And while a one-time gain of $0.26 per share tied to a settlement over a contract dispute won't boost future quarters, Diamond still delivered a stronger result than many were expecting. 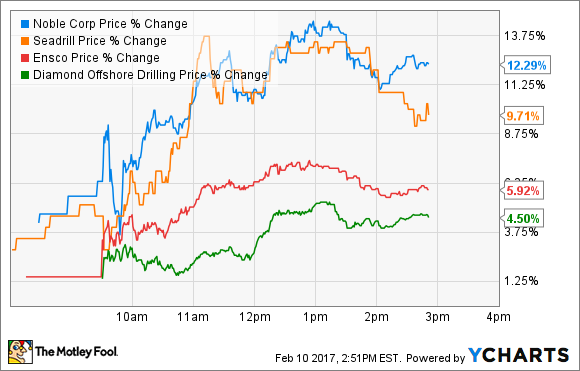 ENSCO is scheduled to hold its earnings call on Feb. 28, while Seadrill will likely report sometime in March. But investors probably shouldn't put too much stock in Noble's or Diamond Offshore's results when it comes to optimism for ENSCO or Seadrill. If you're following offshore drillers, it's probably best to focus more on their balance sheets and less on GAAP profits and revenue at this stage. Look for the companies that are best-positioned to ride out the downturn, which could continue through 2017, and have the financial stability to make it to the recovery. Noble, Diamond Offshore, and ENSCO are all in much better positions than Seadrill in that regard. Seadrill has nearly $5 billion in obligations due within 12 months, while the other three have less than $1.6 billion combined. The others also have a combination of cash and available credit liquidity to address their short-term obligations, while Seadrill has far more debt maturing in the next several months than it has the liquidity to deal with. There is real opportunity in offshore drillers, but also very real risk of permanent losses. Make sure you balance the two, and understand the risks before investing in any of these companies. It's also important to acknowledge that it could take another year -- or more -- before the offshore market really starts recovering.